Thank you Marsha! You should absolutely give them a try! I believe I may do just that, as soon as I work up the courage! Have added you to my Blogroll. 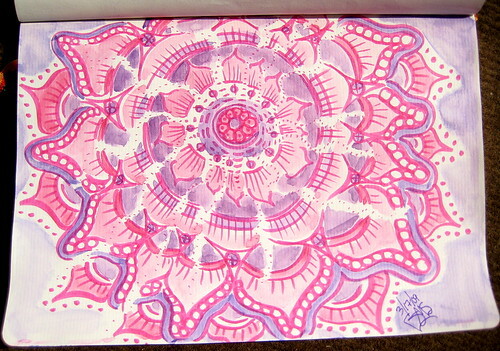 Marsha - Making a mandala is all about the meditative process of doing it - any art that results is a bonus. Just take a pen, and draw a dot, or a small circle in the middle of a sheet of paper. Then continue to work around that center in concentric designs. You don't have to worry about perfect lines or shapes, if you get stuck for ideas just use basic geometric shapes or letters of the alphabet. These are beautiful. I bet you had the best time on that gorgeous day, making gorgeous art. They all turned out well! I love the colours of the last one especially.